The Canon 2525 Copier delivers high-quality print and copy output and scans in color. The Canon ImageRunner 2525 has many sending and finishing capabilities that give you the flexibility you need, with ease. 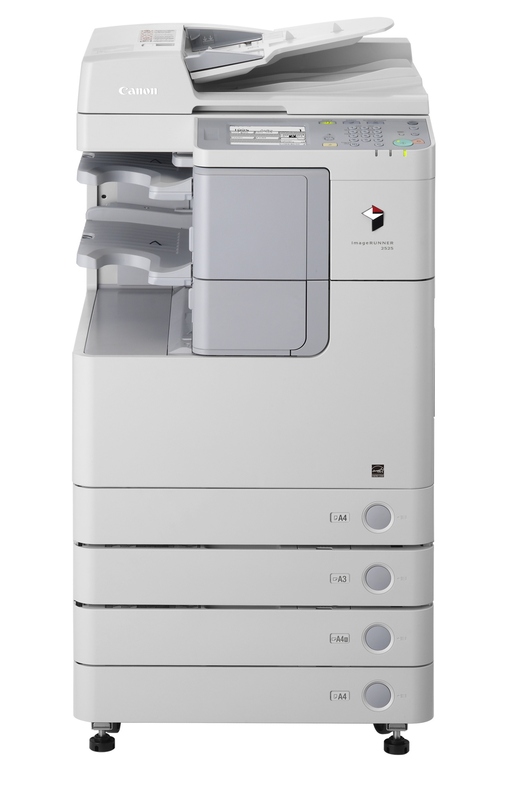 The Canon IR-2525 copier can copy and print in black and white at speeds of up to 25 ppm and scan at up to 35 ppm. Add a productive multifunction device to your team. Copy and print in black and white on the Canon Image Runner 2525 up to 11" x 17". With a print speed of 25 pages per minute, you won't be waiting around long for your prints. You can also scan in color at speeds of up to 25 images per minute, and add a fax option too. The 2525 can handle large volumes, so it's perfect for you if you need to print somewhere between 5000 and 8000 pages a month. This machine can sit on your desk or work as a stand-alone unit, so you can place it wherever it suits you best. Customize the Canon 2525 to fit your needs by adding finishing and sending options - this way you don't waste money on features you don't really want. The Canon 2525 is a compact device that will fit right into your workplace, with a sleek, smart design that will please users and onlookers alike. Everyone will love this copier with its large 5.7” LCD interface that is quick and easy to work with. Finish your documents the way you want, with the 50 sheet multiposition stapling option. With up to 1100 sheet output capacity, you don’t need to worry about doing mass copying or printing jobs. Use Color Send technology to send scanned documents wherever you need - e-mail, USB, or even a particular computer folder. The ImageRunner 2525 features ImageCHIP LITE system architecture. What this means for you is a faster processor that speeds up copy, print, fax, scan, and send functions. 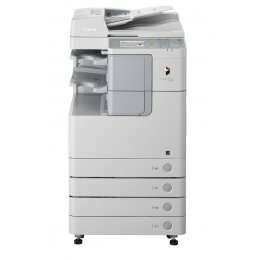 It integrates the different technologies of the copier onto a single chip, enabling highly efficient processing so you can perform multiple functions simultaneously. Receive high quality copies and color scans with a copy scanning resolution of 600x600 dpi. Print resolutions of up to 1200x1200 dpi give you clear text and brilliant images. High yield consumables make sure you won’t be changing your toner and drum too often, leaving you free to run your business. On-the-fly toner replenishment means that when you do need to replace your toner your workflow will not be affected as print and copy jobs continue running. Save on paper and energy with standard duplexing that enables double-sided copying and printing. There is also a 50-sheet DADF (Duplexing Automatic Document Feeder) available, making processing multipage or different sized documents a breeze. Enjoy outstanding image quality and fast warm-up times while the copier uses less heat and energy, due to Canon's RAPID Fusing System. ID Card Copy mode allows you to copy both sides of an ID card onto a single page easily. Conveniently located USB port with an optional hub to connect 3 devices. With Canons Color Network ScanGear software, scanned files can be imported into TWAIN-compliant applications on your desktop. The Image Runner 2525 features UFR II LT printing and 10/100 Base-Tx Ethernet connectivity. Optional PCL 5e/6 and Postscript printing provides added support for your different applications. Your color image data will be well handled with the included support for PDF High Compression technology. The optional Searchable PDF technology can add OCR data to your scanned documents. LDAP address book support minimizes address book maintenance. It allows for browsing the corporate address book for easier scan-and-send operations. Simplify driver deployment with Canon’s Generic PCL6 driver. Enjoy various additional tools including the standard Remote User Interface and support for Canon’s imageWARE Enterprise Management Console application. (with DADF): 35-1/4" x 22-1/4" x 27-1/4"
(with Platen Cover): 31-3/4" x 22-1/4" x 26-3/4"
Sending/Recording Size Statement-R to 11" x 17"